Remember when you were a kid? Waking up on Saturday morning to sit down in front of the television to watch your favorite Saturday morning cartoons? More than likely you shared that memorable childhood moment with a bowl of your favorite cereal and milk. I remember those days and I remember how much I liked that glass of milk. Fast forward 20 years and something is different, besides just my age. I thought it was because I was older and maybe just less tolerant of milk. Every time I drank a glass of milk, I ended up with a stomach ache. So I stopped drinking it all together. I've since learned about the difference between the the milk I drank as a child and the milk that is on the market today. The dairy cows of today are fed a different diet than they were when I was a child. It's common knowledge that cattle are pumped up with antibiotics and fed corn feed (which cows should never eat anyway) and rarely if ever have a chance to graze on pasture. In my opinion, the result of those changes has helped to create the stomach aches when I drink the milk that commonly shows up on every supermarket shelf in the country. There had to be something better and I had to know if it was in fact a change in my body or if it was the change in the milk itself. 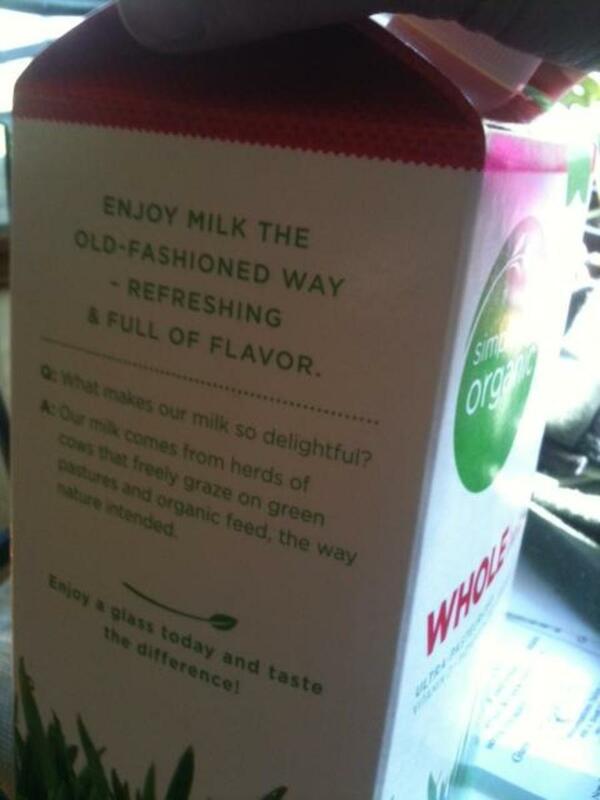 The Q&A on the carton of the 1/2 gallon size of Simple Truth Organic Milk. A trip to the grocery store gave me an eureka moment. Maybe there was something different in the milk and maybe it wasn't me. While walking past the dairy section in the sore, I decided to try a different kind of milk to see if there was a way that I could enjoy one of my favorite beverages again. I looked at soy milk but soybeans have all been GMO for so long now that I nixed that option really quick. Coconut or almond milk just sounds freakish to me. I didn't know you could get milk from an almond and coconut "milk" is nothing more than the mostly clear liquid inside of a coconut, so how do they make it white? Not what I'm looking for here. I found a small section of real cow's milk so I started reading labels. 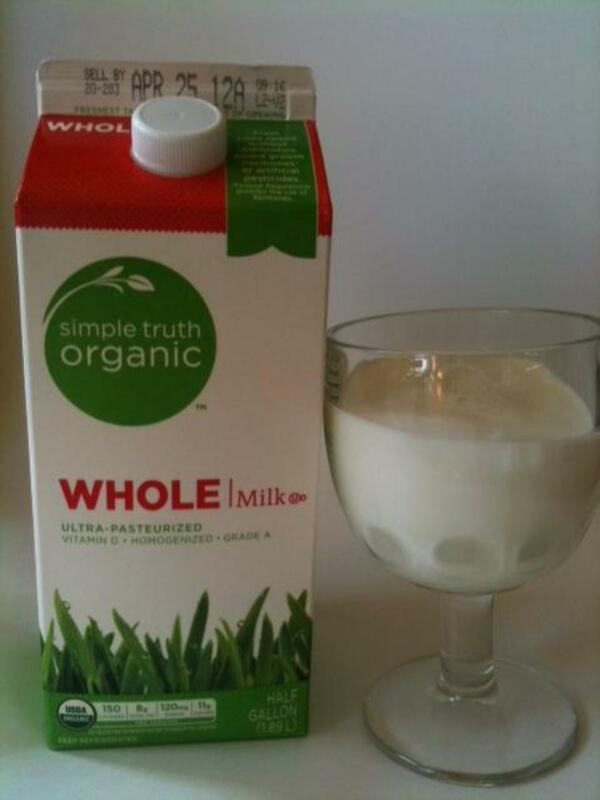 Simple Truth Organic Whole Milk has 3 ingredients. 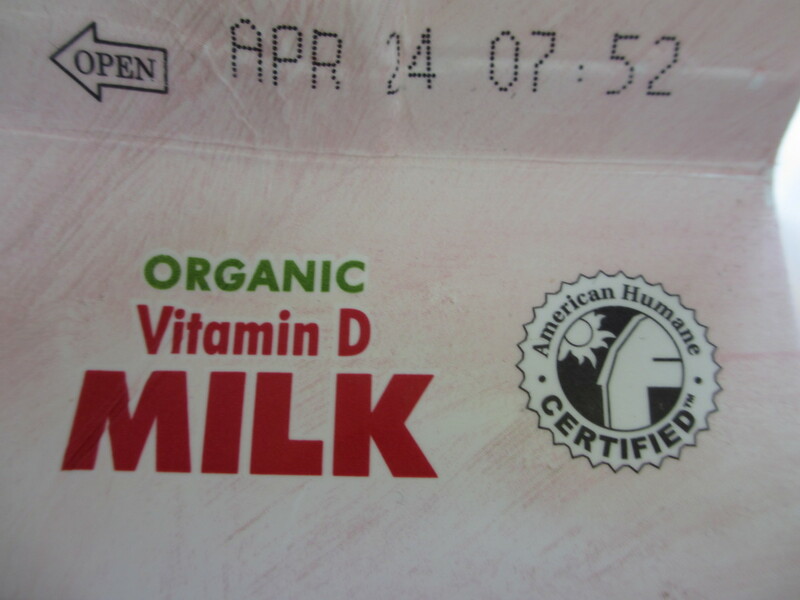 Organic milk, organic skim milk and vitamin D. This brand of milk is Kroger's store brand which actually surprised me. It is milk that is from cows raised without antibiotics that are actually grazing on grass. It has 150 calories in a typical 8oz. glass which I think is on target for whole milk, it's been a while since I've seen a label on mass produced milk. The price tag was $3.99 for a half gallon. A little pricey but if I can drink it without having the resulting stomach aches, well worth it. It's also available by the gallon for $6.29. Do you drink organic milk? Later that evening, I decided I wanted to make some chocolate pudding. 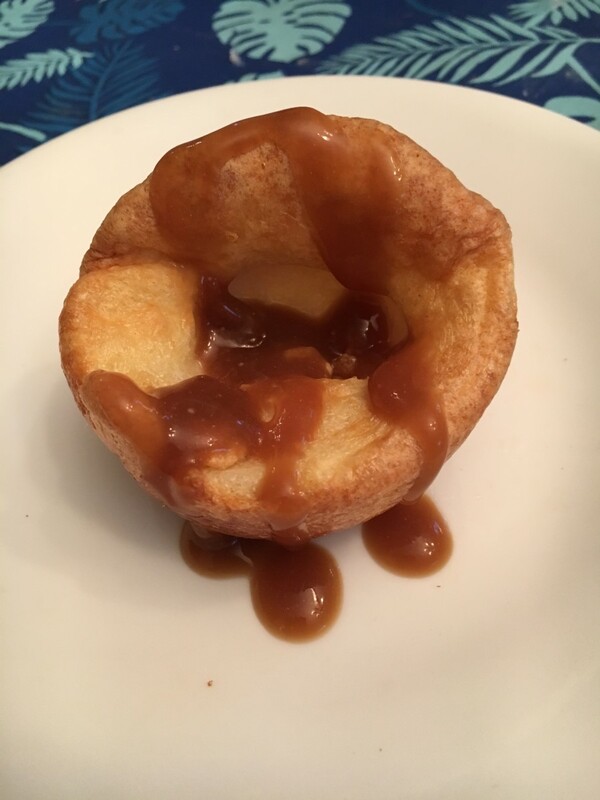 I used the organic milk to make the pudding. An hour later the pudding was ready so I tried it, expecting to hear angels singing and trumpets blaring because I just knew this milk was going to make that pudding taste better somehow. I was wrong. It tasted like the same chocolate pudding I had a month before but that's OK because it's the naked test that matters. I poured a glass of milk to go with the chocolate pudding. The first sip brought a smile to my face. There is a difference in the taste of milk that comes from cows that eat grass and cows that only eat corn feed. What's the difference? There's actually a taste to the milk that comes from cows that eat grass. I had forgotten what really good milk tastes like and this is really good milk. So all that was left to do was wait and see what my stomach thought of it. I waited for the usual soured feeling and nothing happened. No feeling of having what I can only describe as the feeling that there's a ball of cabbage sitting in the pit of my stomach. I've changed over to making this milk a permanent member of my refrigerated staples in my kitchen. It is now the only kind of milk I buy. In my opinion, if you are looking for a really nice organic milk that will take you back to your childhood, this one is it. Hands down. Is Simple Truth branded milk lactose-free? No, it is not lactose-free. where does the vitamin D3 come from in Organic Truth milk? It is fortified with vitamin D. I do not know where the company sources their added vitamins from. 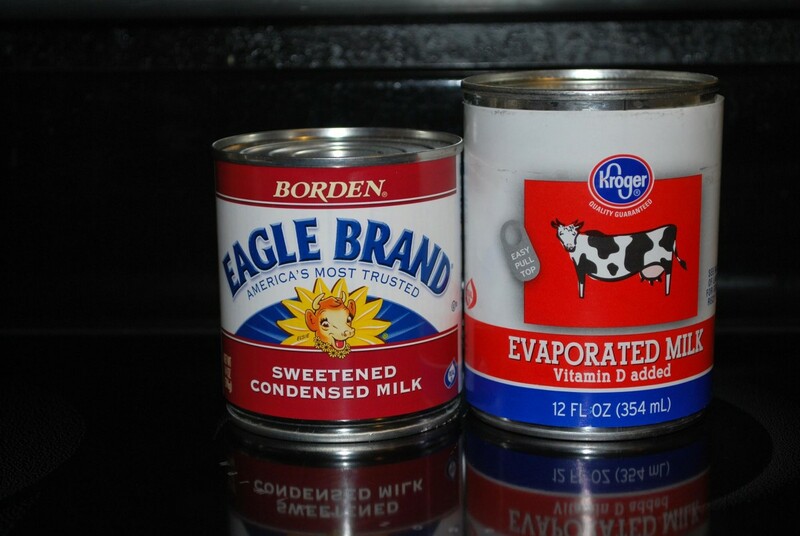 Evaporated Milk vs. 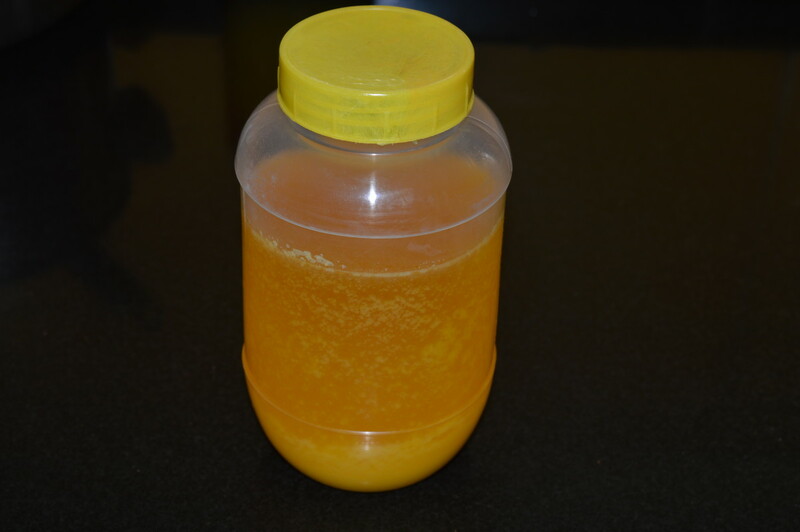 Sweetened Condensed Milk – What is the Difference? You all do realize that the half gallon Simple Truth organic milk is 'ultra' pasteurized don't you? That's what gives it the distinct taste and very long shelf life. Unfortunately, ultra-pasteurization destroys much of the nutritional value of milk. Milk is most nutritious in as close to raw state as possible. For grocery store milk, that means minimally pasteurized, not ultra pasteurized which unfortunately most organic milk is. One thing I noticed when I once drank non-organic milk after going organic, the regular milk taste like it has been sweetened with a ton of sugar. I went organic back in 2010. It got to the point that every time I ate, I would feel ill in the stomach. It had even gotten to the point where i didn't even want to eat because I knew how it would make me feel. I went to the Dr. thinking perhaps I may have a gallbladder problem or something. To make a long story short, not one problem with my health was found. I started doing my own research and after learning of all the toxins that are now put in our food, I switched to an almost complete organic diet. I have never had that ill feeling in my stomach since. 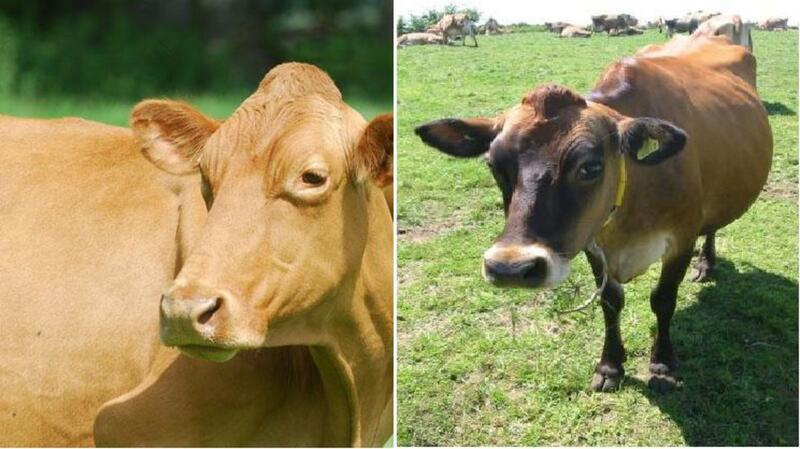 Grass fed dairy has a preferred ration of Omega 3 to Omega 6 fatty acids. The nutritionalist below needs to update their research when it comes to grass fed whole vitamin D milk and obesity. 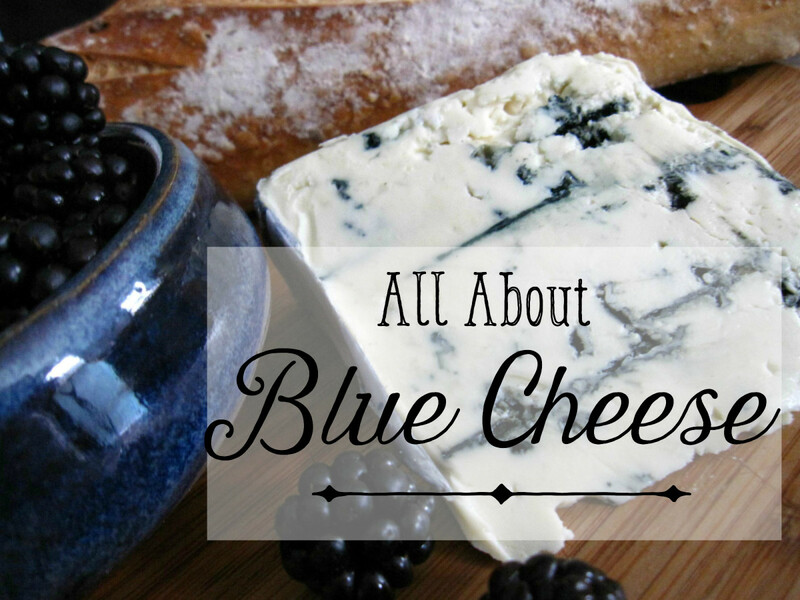 I refer them to Dr. Hyman's work with low carbohydrate diets. Vitamin D3 additives, also called cholecalciferol, is made by the ultraviolet irradiation of a substance derived from sheep's wool. Google it . A glass of milk (possibly low fat) a day is associated with a healthier body weight. There was a study one of my nutrition professors collaborated on several years ago. I personally believe grass fed whole milk products to be higher quality and a beneficial part of a good diet. Also, the only "safe" soy products are those that are properly fermented. You shouldn't eat soy otherwise. You sound like you are stuck in the old school mentality that was prevalent decades ago....zero fat high carb high sugar diet. Forgot to mention two more things: my knowledge comes from evidence based research. Calcium in cowmilk is falsely associated with stronger bones. The opposite is true. Soy milk is the only protection (milk product) against breast cancer as the plant estrogen it has binds to different receptors in humans that actually prevent cancer formation. There is soy milk made from non gmo soy beans, with similar amount of calcium and protein without the potential for triggering cancer. Hope you post this as it is meant to help people though evidence based research. Keep in mind that whether grass fed or not milk, human consumption of cow milk is associated with breast cancer and prostate cancer. It is designed to bring a 65 pound calf to 700-900 pound from birth to 9 months, and is also associated with obesity in humans. I absolutley LOVE this milk. 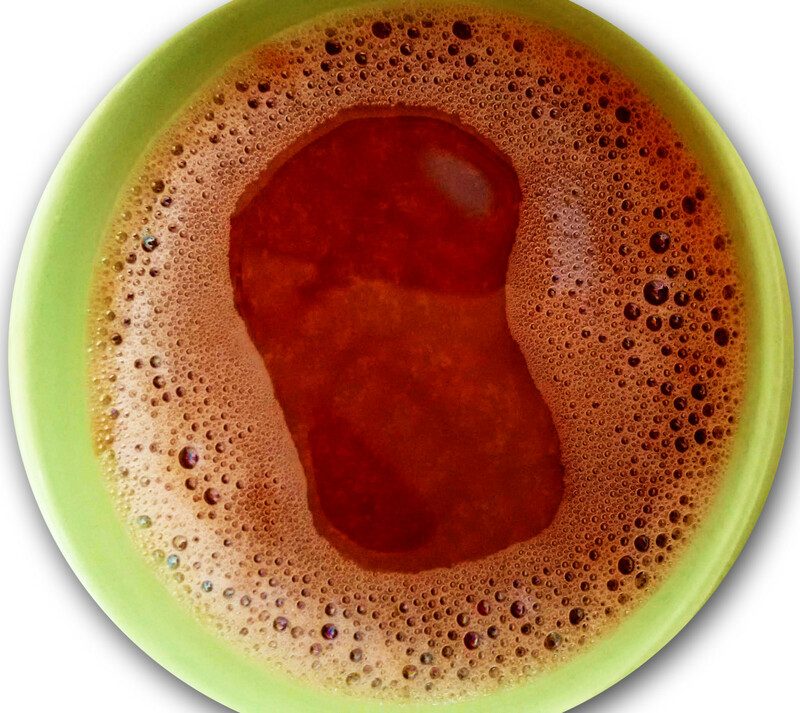 I just recently descovered it,and the taste reminds me of European rich milk i grew up drinking. I will never again buy anothing else,cause this is what i've been searching for for many years. I know this is an old post, but for anyone who happens to see this I thought I would add my two cents. - organic soybeans are non-GMO. So organic soy milk would be non-GMO by extension. - the liquid in a coconut is actually coconut water, not milk. Coconut milk is actually taken from the flesh of the coconut, which is why it's white. - almond milk (as with all nut milks, to my knowledge) are created by blending the nut with water until it is well pulverized and then straining out the solids. This is actually quite easy to do at home if you have the inclination. 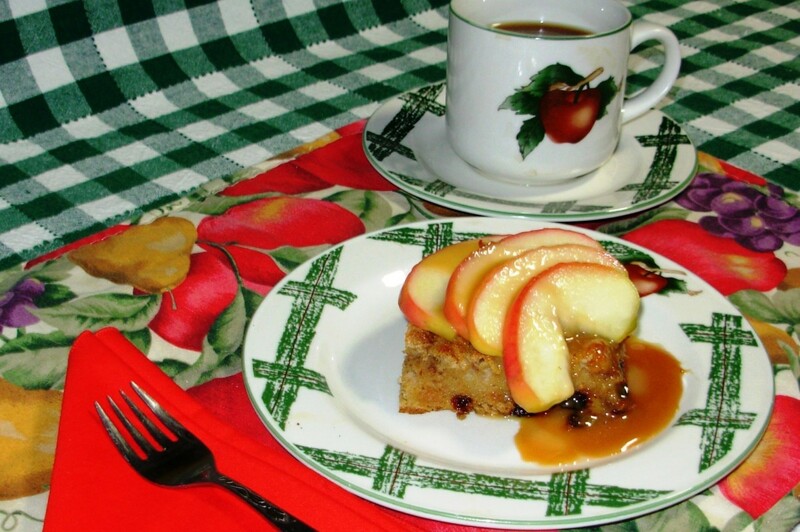 In my opinion, homemade is much tastier than any of the store brands that I have tried. I actually recently stopped drinking and using cow's milk after doing more research on it. That is really interesting that the vitamin D comes from fish! YUCK! I'll have to checkout the label on one of these next time I go to Kroger, thank you for sharing that. Do you know where the vitamin D is from? The Talapia in the milk. Yes, fish. Check the ingredients again. Just something to think about since you thought coconut and almond milk were freakish. I have a hard time with it. If it just said fish oil I could probably handle it, but the fact that it just says straight out Talapia really gets me. I don't remember off the top of my head but I think the gallon size is in a regular, clear plastic milk jug instead of the carton. That may be part of the reason why the shelf life is shorter. It could also be because more people are inclined to buy gallons than the 1/2 gallons so the gallon size selection is always smaller. I just tried this milk and I was pleasantly surprised. What originally drew me to this milk was the long shelf life. I don't drink that much milk and ended pouring whole containers down the drain. The half gallon I bought had a 6 week shelf life but the gallon containers only had a 2 week shelf life. I don't understand that but I don't have a problem spending the extra money if I don't have to waste it. Nice hub. If you are going to eat animals/animal products, it is important that the animals themselves eat what they were meant to eat! On the packages here it does. There's a "Q&A" on the side of the carton. The question is "What makes our milk so delightful?" The answer is "Our milk comes from herds of cows that freely graze on green pastures and organic feed, the way nature intended." Green pastures are made of grass. It may not be on the cartons that you have but it is on the 1/2 gallon cartons that I buy at my Kroger. Simple truth organic does not say its from grass fed cows on the package. Did you find this data somewhere? Thank you! I think you are right. A lot of the medical problems that people have now are a direct result of the changes in the food industry over the past 15ish years. Our food is garbage for the most part. Hubby and I are going back to basics. Having our own chickens and growing our on veggies and canning. We have already started buying 1/4 cow every year (going in with 3 other families) from a farmer we trust & having it processed ourselves. I'll be writing more about those things as they happen. You really do have to watch what you put in your mouth now because it can literally kill you over time. I'm so glad to see you writing these reviews!! I try to encourage people to eat 'real' food, because the growing rates of cancer, I'm convinced, are because our diet has deteriorated - to the point where we ASSUME it's crap, and have a special label if it's 'organic' - you know, the food we produced before all the pesticides, fertilizers, hormones, gmos... the list goes on. Great info - looking forward to reading more of your hubs!! I would love to find someone around here who sells raw milk. The closer something is to the original state, the better in my book. You are so right! Organic is the only way to go...or buy your own cow...lol. I don't drink much milk, but when I do, I buy it from a local farm. She sells it raw, and I like that for making my own yogurt. Great Hub...vote up and interesting...oh useful too.